Grape vs. 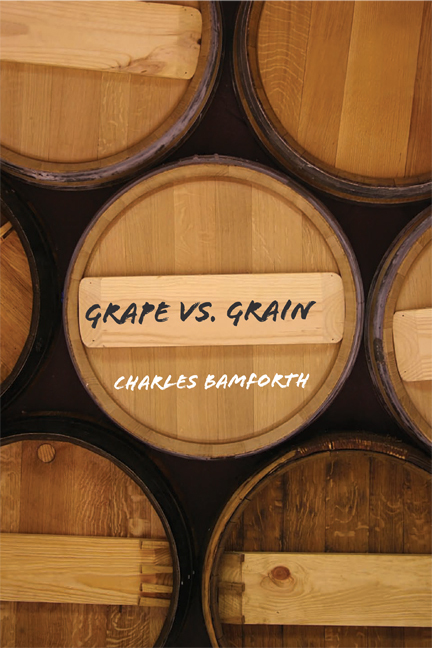 Grain author Charles Bamforth weighs in on Fridays with his ideas about the relationship between beer and wine, as well as some little-known facts. I was recently in a restaurant with a bunch of guys from a well-known North American brewing company. We each ordered their flagship lager and were appalled by what arrived. The beer, of course, was great. No, it was the glasses: rolling around in each of them was an olive. My protest was met with the retort “but this is a poor man’s cocktail”. Now, being beer folk, we eschewed wine. I am pretty sure, though, that if we had opted for a Pinot Noir or a Chardonnay, the theater would have been entirely different, with much ceremony of presentation and celebration of the label, ritualistic de-corking and pretentious nosing of the bouquet. I suppose I should at least have been grateful that we got glasses and weren’t expected to do what seems to be the norm in many eating houses, namely to swig the beer straight from the bottle. What a curious habit that truly is: when did you last see someone order a delicate little number, say a Mouton Rothschild Chateau, and heave it down their gullet straight from the container? Wine and beer both contain phenolic antioxidants. It has been shown that one of these in beer (ferulic acid) gets into the body more efficiently from beer than it does from a tomato. 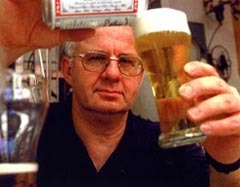 The desire to pee is less when you drink stale beer as opposed to fresh beer.